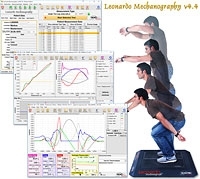 Data acquisition and Data analysis software for all Leonardo Mechanograph measurement devices. Leonardo Mechanography v4.4 uses a common user interface to control measurements and to analyse the results for all Leonardo Mechanograph systems. Focus of the measurements is the objective quantification of the function of the fast muscle fibers. The measurements are based on every-day movement patterns like rising from a chair, hopping or jumping. This allows the analysis of the anaerobic peak power especially for high-dynamic movements. The resulting findings allow analysis of the muscle function beyond the standard methods like ergometry, isometry or isokinetics. This type of analysis is not only relevant for athletes but also for every day capabilities especially in aging: Movements like stair climbing, getting up from a chair or fast hopping to avert falling requite a very high performance (power) which cannot be characterized adequately by analysis of the slow muscle (e.g. when using a cycle-ergometer). At the same time Mechanography does not need complicated measurement devices or setups and therefore can be applied using a minimum of time (e.g. only 5 minutes for a standard assessment consisting of 7 tests). The two separated force plates using 4 sensors each allow the analysis of side differenced during symmetrical movements like jumping. It also allows the calculation of the position of the force vector entering the platform (CoF, CoP) and its variation over time. This allows balance measurements based on the well-established Posturometry methods. Over 80 international scientific publications have been using Leonardo Mechanograph systems. The studies include reference data for children and adults in Europe, the US and Asia as well as the effects of different types of professional sports as well as of difference diseases on the typical outcome parameters. Leonardo Mechanography is one of the standard tools used for bed rest studies of the European Space Agency (ESA) as well as many international research groups due to its high reproducibility, easy and fast application and the high variety of supported measurement types. The software includes extensive reference data for the age span of 3 to 99. All acquired measurements and analysis results are stored in a database. For a multi-user environment this database can be stored on a central server. This way several measurement and analysis seats can be used simultaneously*. The Unify Database engine introduced with v4.4 allows the Integration of Leonardo Mechanography, Galileo TPM and Stratec xCT within only one database. The trend analysis allows two different applications: The visualization of changes within the most relevant parameters within a repeated tests (e.g. multiple hopping or chair-rise) from repetition to repetition, or the visualization and documentation of any analysis results of selected measurements. Assessments summarize the most relevant results of different measurement types per client/patient and measurement day. It allows a quick overview over the current neuromuscular situation of a client/patient. The software supports the simultaneous connection of several Leonardo Mechanograph Systems (e.g. Leonardo Mechanograph GRFP and Leonardo Mechanograph Stair) to one PC. Depending on the selected measurement type the software then automatically selects the corresponding Leonardo Mechanograph system. This module allouws the definition of complex database queries. The resulting datasets can be analysed statistically and can be visualized. Easy to use assistants allow selection of analysis results and their export using text-bases exchange formats like CVS files, which can be imported by statistics programs or spread sheet programs. Selected analysis results as well as selected plots or a single or multiple measurements can be exported. *) This function is only available in the research version (RES). Price: On request. Please contact us for your personal quote. Please select your country or contact our local distributor to ensure the product is available.